Police Officer Gorantla Madhav shot to fame by twirling moustache against JC Diwakar Reddy during the controversy related to Prabodhananda Swami Ashram few months ago. Later, He took voluntary retirement and joined YSR Congress Party. YS Jaganmohan Reddy preferred this Former CI as the MP Candidate for Anantapur Lok Sabha Constituency. This is when TDP begun the mind game to have an upper hand over YCP in Anantapur Lok Sabha Constituency. 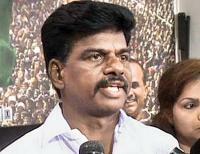 Although Gorantla Madhav took voluntarily retirement two months ago, TDP Government is yet to approve his resignation. A doubt has been raised that Gorantla Madhav's nomination could be rejected by Election Commission citing technical issues. Gorantla Madhav can't contest elections if he doesnâ€™t get clearance for voluntarily retirement by end of nomination process. Generally, There will be three months time to approve Voluntary Retirement Application. It will be approved automatically after 3 months even if Government doesn't take any decision. March 25th is the last date to file the nomination. By then, 3 month period won't be completed. TDP Government could use this rule to prevent him from contesting elections. Gorantla Madhav is seeking the legal opinion to plan his next move. YCP MP Candidate accused IG of harassing him by not approving voluntary retirement just because he is a BC. × RELATED YCP Candidate Delighted - TDP Govt Shocked!